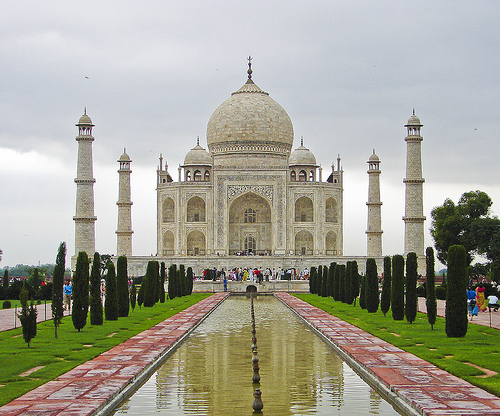 The Taj Mahal is now most famous tourist attractions in India. It was commissioned in 1632 by the Mughal emperor, Shah Jahan to house the tomb of his favourite wife, Mumtaz Mahal. The Taj Mahal was designated as a UNESCO World Heritage Site in 1983. The interior chamber of the Taj Mahal reaches far beyond traditional decorative elements. The actual tombs of Mumtaz Mahal and Shah Jahan in the lower level. Mysore Palace is now 2nd most famous tourist attractions in India, after the Taj Mahal, with more than 6 million annual visitors. Ambavilas Palace, otherwise famous as the Mysore Palace, is a historical palace and a royal residence at Mysore in the southern Karnataka state. The Diwan-e-aam, a public durbar where the general population could meet the king at scheduled times to submit petitions. The palace complex includes twelve major Hindu temples. The oldest was built in the 14th century, while the most recent was built in 1953. Sri Harmandir Sahib (lit. 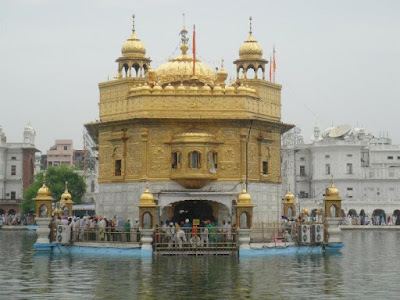 "the abode of God"), also known as Golden Temple and the Darbar Sahib, is the holiest Gurdwara and the most important pilgrimage site of Sikhism. 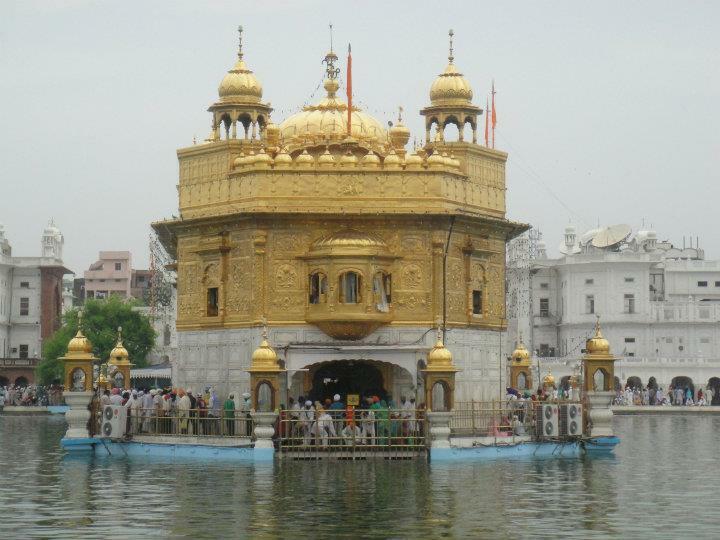 It is located in the city of Amritsar, Punjab, India. Additional buildings include a clock tower, the offices of Gurdwara Committee, a Museum and a langar – a free Sikh community run kitchen. Over 100,000 people visit the holy shrine daily for worship. 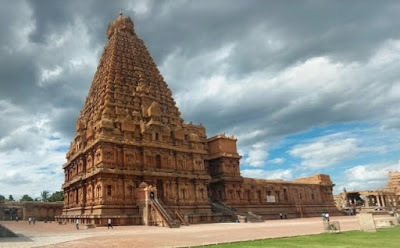 Brihadeeswarar Temple is a Hindu temple dedicated to Lord Shiva located in Thanjavur in the Indian state of Tamil Nadu. It is also known as RajaRajeswara Temple Rajarajeswaram and Peruvudayar Temple. The temple is part of the UNESCO World Heritage Site known as the "Great Living Chola Temples". 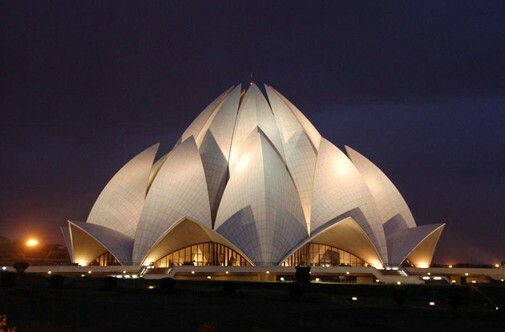 The Lotus Temple, located in Delhi, India, is a Bahá'í House of Worship that was dedicated in December 1986. 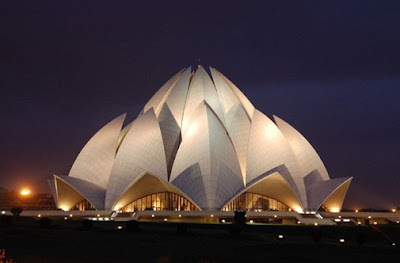 Bahá'í Houses of Worship, the Lotus Temple is open to all, regardless of religion or any other qualification. The building is composed of 27 free-standing marble-clad "petals" arranged in clusters of three to form nine sides. The Bahá'í Faith teaches that a Bahá'í House of Worship should be a space for people of all religions to gather, reflect, and worship. "Palace of winds" or "Palace of the Breeze". Is a palace in Jaipur, India, so it is named because it was essentially a high screen wall built so that the women of the royal family could observe street festivals while unseen from the outside. The structure was built in 1799 by Maharaja Sawai Pratap Singh. 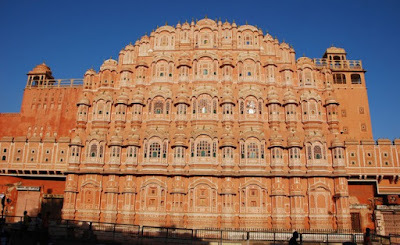 He was so intimidated and inspired by unique structure of Khetri Mahal and he built the grand and historical Hawa Mahal. It was designed by Lal Chand Ustad in the form of the crown of Krishna, the Hindu god. 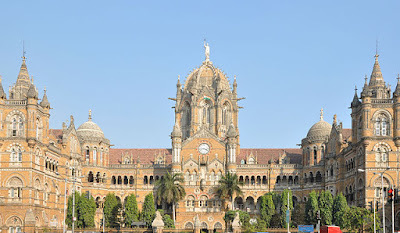 Formerly known as Victoria Terminus is a historic railway station and a UNESCO World Heritage Site in Mumbai, Maharashtra, India which serves as the headquarters of the Central Railways. The station's name was changed from Victoria Terminus to Chhatrapati Shivaji Terminus in March 1996 in honour of Emperor Chhatrapati Shivaji, founder of the Maratha Empire. In 2017, the station was again renamed Chhatrapati Shivaji Maharaj Terminus. 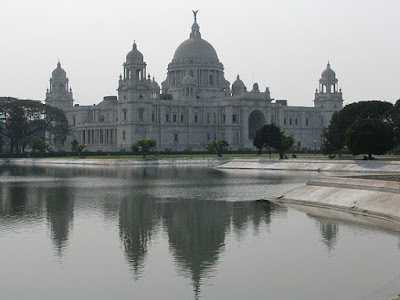 Victoria Memorial , West Bengal, India. which was built between 1906 and 1921. 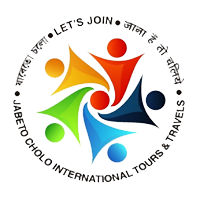 It is dedicated to the memory of Queen Victoria and is now a museum and tourist destination under the auspices of the Ministry of Culture. The Prince of Wales, later King George V, laid the foundation stone on 4 January 1906, and it was formally opened to the public in 1921. The memorial lies on the maidan (grounds) by the bank of the Hooghly River, near Jawaharlal Nehru road. 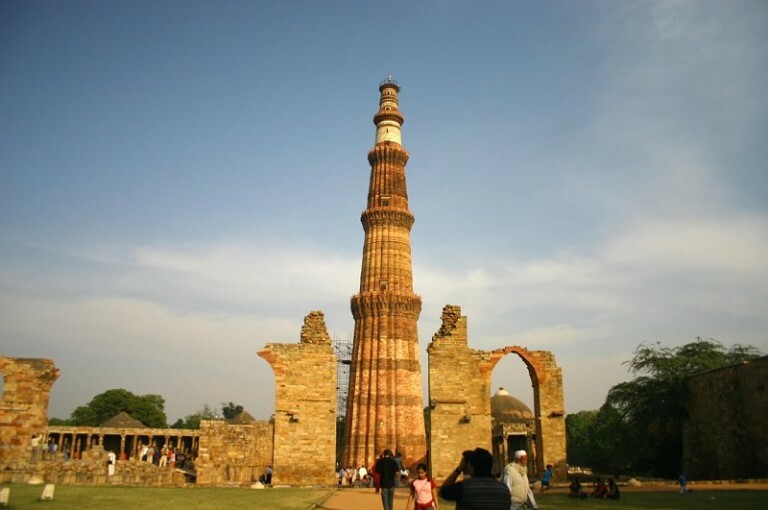 The Minar is surrounded by several historically significant monuments of the Qutb complex, including Quwwat-ul-Islam Mosque, which was built at the same time as the Minar, and the much older Iron Pillar of Delhi. Qutub Minar is a minaret that forms part of the Qutb complex, a UNESCO World Heritage Site in the Mehrauli area of Delhi, India. Qutb Minar was established along with Quwwat-ul-Islam Mosque around 1198, by Qutb-ud-din Aibak. It is one of the most ancient and popular Buddhist monuments in the country. Sanchi Stupa is located in the Indian state of Madhya Pradesh. The Stupa is a dome shaped mound, surrounded by a circumferential pathway. The Stupa contains several chambers, which contains the relics of Buddh. The original structure of the Stupa was commissioned by Emperor Ashoka. Sanchi Stupa went under major restoration work between 1912 and 1919, under the supervision of Sir John Marshall. Most of the Buddha statues and carvings at the Sanchi Stupa still possess the legendary Mauryan polish. 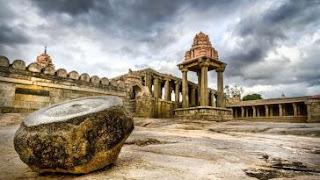 It was from the Ashoka Pillar of Sanchi Stupa that the national emblem of India was derived. 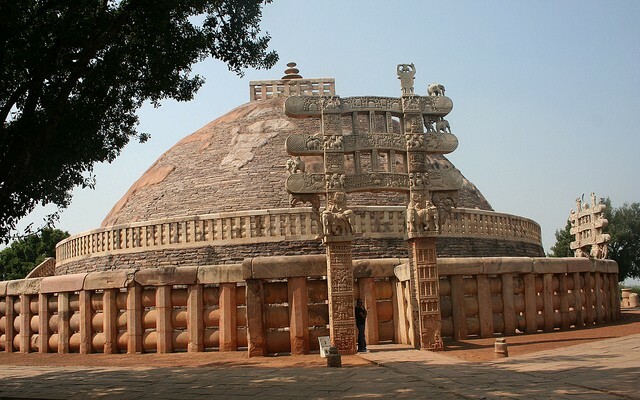 Sanchi Stupa is a UNESCO World Heritage Site.